For a limited time, tell us what Microsoft Press book is on your shelf and receive a special discount code to save 90% on the multi-format eBook edition! 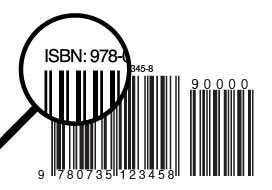 Locate the ISBN on your book’s copyright page or back cover to get started. A unique code will be displayed on screen after you submit this form. Please note: Products submitted for this special offer will not be listed as registered products in your microsoftpressstore.com account. For additional benefits, register your book today. I just found this on Microsoft Site..